A field trip to Skullcandy's new HQ reveals a world of pure imagination. I missed the party—the one Skullcandy threw in June to flaunt their new headquarters. As a longtime user of the company's earbuds and headphones, I was keen to check it out. So I was tickled when the company agreed to give me a personal tour and interview with CEO Jason Hodell. In my head, Castle Skullcandy was secreted among rolling hills in the Park City mountains. My mental image spliced Dr. Weird's mountaintop lair in Aqua Teen Hunger Force with Willy Wonka's fantastic chocolate factory—only instead of a platoon of ominously singing Oompa Loompas perfecting Everlasting Gobstoppers, there'd be a team of audio dorks seeking perfect sound. As it happens, the company's new digs sit immediately off of I-80 on Landmark Drive, just beyond a McDonald's. But it does skew Wonka-esque. The spacious, modern-designed lobby instantly conveys chill; with anti-Muzak bumping overhead and a retail annex, it feels like a mall store. I arrive and am given a visitor pass—a wood-carved, two-dimensional skull logo on a lanyard; I wanna flash it around like the Alice Cooper backstage passes in Wayne's World. And, lo, there is candy! A giant bowl (alas, not a skull) of mostly Dubble Bubble bubblegum. Next to the reception desk sit three scooters—hope springs that we'll ride these on the tour. "We were busting out at the seams," Senior Global Brand Manager Kathryn Smith says as we walk. The old building, the company's home for its first 13 years, had become a chaotic, cluttered, cramped workspace. She continues, "We really knew that we kind of needed to grow up just a little bit more." But not too much, because you gotta keep the Oompas humming; happy workers are productive workers. Skullcandy is geared toward the young and young-at-heart, anyway, so the new HQ has all kinds of youthful, stress-busting amenities: a putting green; a basketball court; and an employee lounge with a half-pipe, foosball, billiards and ping-pong tables that opens onto an expansive south-facing deck with a mountain view. The deck was party central, where attendees danced to Watsky and mingled with brand ambassador athletes, like Olympic snowboarder Mark McMorris and Australian motorbike stunt rider Robbie Maddison. As if on cue, as we enter from the deck, Hodell—tall, ginger and fit—descends the stairs. We exchange pleasantries and plan to meet in the employee green room shortly. Upstairs, Smith shows off the new open workspaces. The lack of cubicle walls and abundance of windows provide an appealing blend of artificial and natural light, and inspiring pastoral views. The atmosphere, she says, is meant to foster collaborative creativity. Back on the main level, the green room is decorated in contemporary furniture. There's a fridge, a bar and musical instruments for break-time jams. Hodell chooses a seat in the middle of the room. The towering redhead seems too chill to be a CEO, which shouldn't be a surprise, given Skullcandy's vibe. But he's no executive manchild; his comportment splits the difference between casual everydude and the measured gravitas expected of a head honcho. He leans toward the former, indulging personal questions like the first time he listened to music on headphones. It was while attending the United States Military Academy at West Point, where music was the only escape from the rigid, disciplined environment. He and his fellow cadets freely shared their CD collections, so Hodell lost himself in the sounds of the Cure, Depeche Mode, Erasure, Yaz, Simple Minds, AC/DC and Billy Idol. Until late 2016, Hodell was the company's chief financial officer/chief operations officer. He took the reins just as the new building opened, following the purchase of Skullcandy by Mill Road Capital in October. Previously, he'd been concerned with financial planning, forecasting, results, factories, inventory, product development and quality. He says the work made him very tactical, and prepared him for his new gig, where he's constantly thinking strategy, with both eyes on "getting back to the roots of the brand in music. That's thrilling for me—'cause, you can tell, I dig [music]." Business beckons, and Hodell excuses himself. Smith introduces Senior Manager of Product Experience Sam Noertker, who leads us through the main-floor workspaces where techies tinker and build prototypes. Once more, the work areas are open. There's still clutter in the form of tools, wires and workshop detritus, but even that seems to have a place. 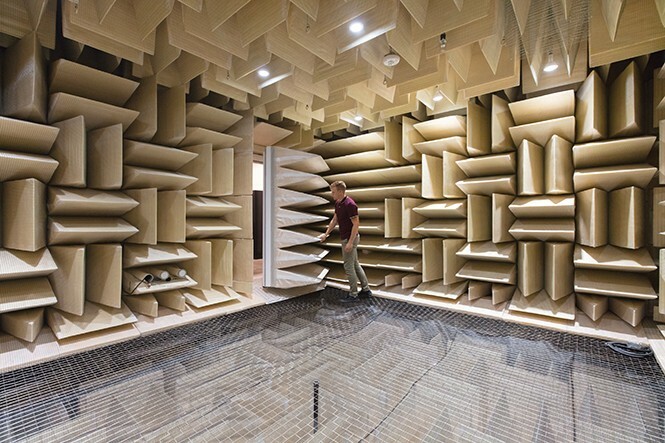 Noertker saves the best part—the anechoic chamber—for last. It's a room without reverb, ensconced by, but not actually attached to, the building, to avoid electrical interference and ambient noise from things like heating and air-conditioning systems. Every wall and the ceiling features patterns of noise-dampening wedges caged in wire. A similar surface sits below the floor, a wire grid that feels like a trampoline; the urge to jump and shout is nigh- irresistible. Noertker explains that the room's purpose is to enable Skullcandy's mad scientists to hear only the audio emanating from their products. "The reason [the wedges] are so big is that deep bass frequencies are really big," he explains. The entire experience lasts roughly 90 minutes, but ends too soon. In the car, I realize I'm still wearing my visitor's badge. I consider keeping it as a souvenir, then decide to return it, because maybe they'll let me stay. But instead of asking, "Are you hiring?" I leave the badge without a word, and head down the mountain, leaving the occupants of Castle Skullcandy to their fun.